I’m getting the annual Fantasy Oscars game cards out a little late this year, but I just couldn’t leave you guys hanging. I’m actually overwhelmed by the amount of people who’ve reached out to me since the Oscar nominees were announced to find out if I’d be preparing the Formal Fringe Fantasy Oscars deck again. Looking for the 2016 edition? I’m so glad you guys have so much fun with this game. This is now year four for me hosting the game for friends, and year three of releasing the Fantasy Oscars deck here on Formal Fringe for each of you out there to play along. What started as a fun way to get both film buffs and casual moviegoers into the Academy Awards has turned into something that many of you look forward to each year! 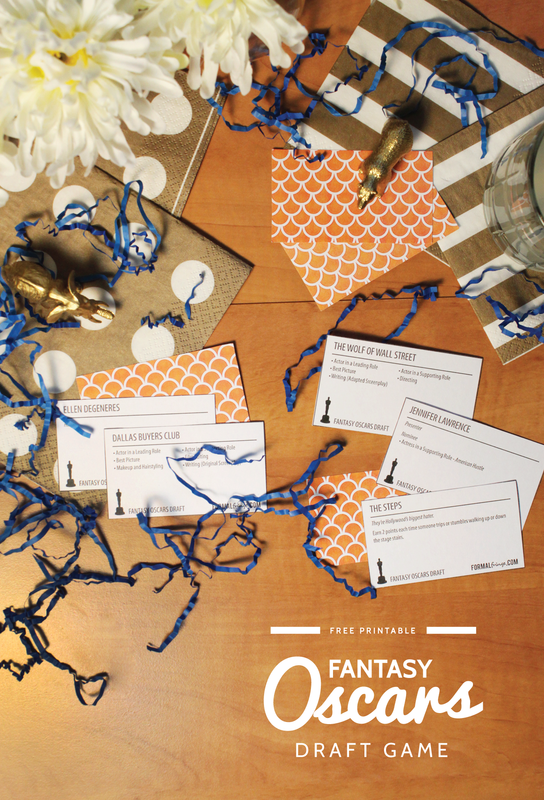 Print out the deck of Fantasy Oscars cards (they’re sized to fit Avery tear-apart printable business cards), then spread them out face-up on a table or pinned to a cork board to create your draft board. Players take turns drafting their favorite movies, actors and presenters onto their Fantasy Oscars Team until everyone has a full hand (5-7 cards depending on how many you’re playing with). 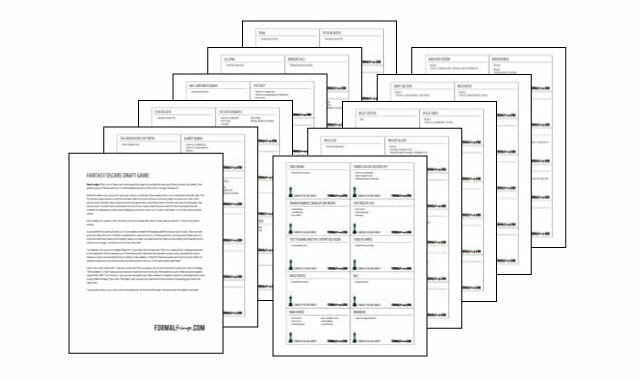 As you watch the Academy Awards on Sunday, March 2, each player earns points based on what happens to the people and films in their team’s roster. Getting shown or named on screen earns one point, while winning an award earns three. It’s a great way to get guys involved in Oscar parties, too. I’ve found that husbands and boyfriends are less than thrilled at watching the Academy Awards. By turning it into a game that borrows elements from Fantasy Football, everyone’s competitive streak comes out. It’s a great way to liven up an Oscar party for two or twenty people. All you need to make the deck and play is a printer and 15 sheets of cardstock (or print it on the back of scrapbook paper like I did!). This is awesome – thanks so much! I host an Oscar Party every year (I’m on my 13th annual this year!) and after that many years I’m always trying hard to find new games and new ways to make it fun for my guests. This was by far the best find I stumbled across. Thanks, Tara! Hope you and your guests have a blast! Quit my job to stay home with kids and moved to the burbs from Chicago a year ago. Finally have some friends out here and hosting my first Oscar party! Thanks for the fun game to kick off what will hopefully become a great tradition. So happy to hear that! It’s such a great feeling to entertain new friends. Hope you have a blast playing the game! 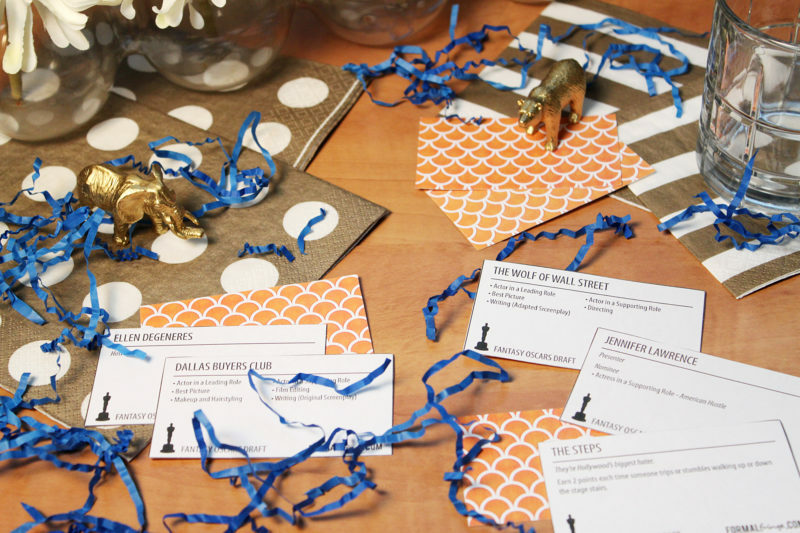 A friend hosted an Oscar Party this year and used your game… talk about a winner. Everyone was super engaged and had so much fun with it and are looking forward to next year’s Oscars already!